These colours of rich pink and purple together set each other off so well. Between them is a crystal rhinestone rondelle with the aurora borealis coating that lends a faint blue hue to this great sculpture. 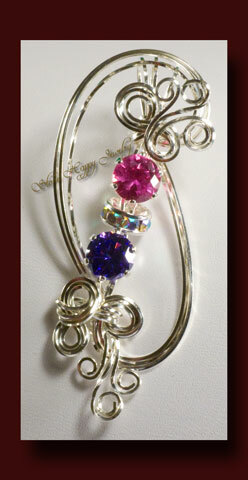 All the wire is sterling silver as well as the settings for the pink and purple faceted cubic zurconias. The length of this piece is 2 1/2 inches and will include an 18 inch silver plate chain making it ready to wear or to give as a gift. If you would like a sterling silver chain, let us know at the time of placing and paying for your order and we will track down the additional cost for the sterling chain at that time for you.